A great camping hatchet is essential for a serious camper or outdoorsman. Unlike something you’d use at home for chopping wood, you’ll find some options for light weight and durable counterparts below. Don’t underestimate the many uses for this tool. Not only is useful in the most low-intensity of camping situations, it might be a life-saving tool should you go for more rustic camping or if your situation suddenly becomes a little more wild than you had first envisioned. If you are leaving home for the outdoors, make sure one of these great camping hatchet picks is packed! Our gold pick and winner of the best of the best in the camping hatchet category is the Gerber Bear Grylls Survival Hatchet. This tool is not made for your ordinary day to day wood chopping. It is designed for ease while camping but particularly for its practical use as a survival tool. It is a great value at only about $30 on Amazon, particularly when you explore further its design elements. 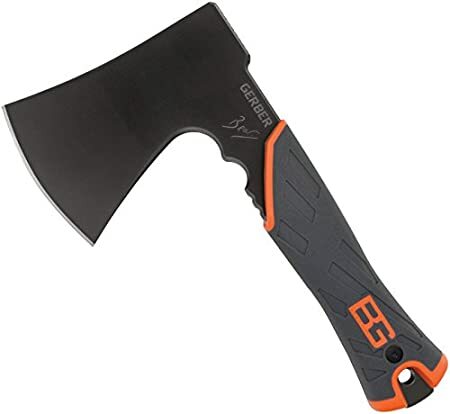 Gerber created a hatchet that is easy to use in the event you need it for your survival. What that means to you is that it is lightweight, easy to carry, and easy to use. It’s designed to use in survival situations with its non-slip rubber handle. At only 2.4 ounces in weight, this thing is seriously tiny and ready to pack into your gear box. It’s dimensions are a mere 2 by 6 by 13 inches. If you are buying and bringing it along for your first use, the original packaging is 1.1 pounds so best to unpack and stow without the additional packaging. Gerber is a Portland, Oregon based company that has been making exceptional knives since 1939. They’ve been renowned for their high quality materials and in the 50’s and 60’s begun specializing in outdoor hunting gear. More recently Gerber has applied their expertise to multi-tools, hatchets, and handsaws, as well as other survivalist gear. With the range of great products that Gerber offers, you could easily set yourself up to have a complete set of tools that will cover your needs as an outdoorsman or woman. The Bear Grylls collection is custom designed for an individual who feels confident enough to go deep into the wilderness, should it be to hunt, camp, or just get off the grid. Other items in the collection include knives, whistles, multi-tools and an assortment of other necessary gear for the survivalist. With the Gerber survival hatchet, you’ll be able to get that fire going as soon as you are ready to set up camp. Building a shelter will be a piece of cake, even in the rain, with it’s non-slip rubber handle that it easy to grip. The blade is exceptionally sharp which makes for ease of use but does necessitate that you keep it in its long-lasting nylon sheath in between use. Those that feel more at home outdoors that indoors will find this hatchet to be the perfect addition to their lifestyle. It’s important to remember that this ax is compact, not a good choice if you are looking to split up wood for the fireplace out back. It is compact and light weight but is built full tang. What that means to you is that the entire ax blade, head, and handle are one piece as opposed to three. When you build something that you want to last for years, full tang it the only way to go. This hatchet is beyond durable and won’t let you down after only a season of use! Gerber definitely did not design this however for the novice user who has never before swung an ax. The blade is made from 5Cr13 stainless steel. It might look sleek and pretty, but the blade is exceptionally sharp. Take caution where you leave and store this because left in the hands of a child it could be extremely dangerous. It’s also important to consider that if you are packing light, this hatchet will add on a certain amount of weight that might not make it appealing to carry for long distances, especially if you are already packing a great survival knife. It is meant primarily for those that camp and will have work to do with wood, though it also would be very handy if you were really building your own shelter. Consider your adventure and your bandwidth for carrying weight when packing and you’ll be able to discern which tools are the most important to take along. In all, the Gerber survival hatchet is a fantastic quality tool at a very reasonable price. It’s extremely sharp edge makes it versatile for many outdoors tasks, and it is a great addition to your Gerber outdoors collection. 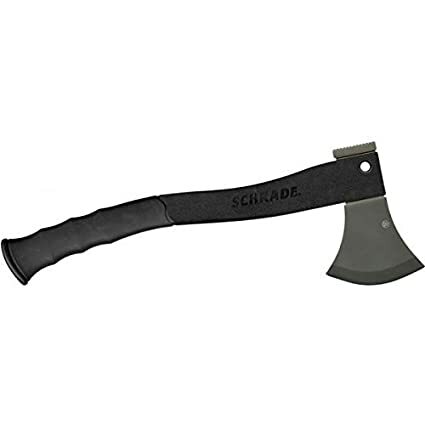 The Schrade 15.7 inch Survival Hatchet is a fantastic option at a great price point. At about $40 on Amazon, it a solid little axe that does the job without breaking the bank. Schrade is part of the Taylor Brands family brand, a cooperation between several different quality brands like Old Timer, Uncle Henry and Imperial. Taylor Brands also produces product lines within the infamous Smith and Wesson brand name. The focus of all these collections is tactical and survival gear. Schrade itself produces a fantastic array of quality knives, spear points, hatchets and multi-tools. This particular model, 3Cr13, is a not particularly compact. It has a slip-proof TRP rubber handle and a stainless steel blade with included fire striker and sharpening stone. It may not be the tool you take backpacking if your bandwidth for weight is a concern, though it would excel on those trips. It is for the survivalist who needs to chop lots of wood with an axe heavy enough to handle that burden, this is a great choice. When swinging an axe, its important to remember that something particularly light will not do the job of chopping wood nearly as well. You need some weight to make a clean cut. Technical specs include a 4.2 inch stainless steel blade and a 6.8 inch handle. Unfortunately these elements are separate, which makes it not the most premium of the survival hatchets that Schrade offers. For its price point and materials, it is still a great buy. Possibly because they were trying to appeal to both right and left handed consumers, some customers have commented that the rubber grips on the handle are a little disconcerting. Another complaint from some users is that soon after arriving, the blade chipped. This is not a hugely common complaint but it does happen enough in the reviews to where it might need to be on your list of pros and cons. The blade is exceptionally sharp which might be part of the problem. With some hatchets with duller blades folks are accustomed to striking their wood at an angle and velocity that might not be necessary with the Schrade survival hatchet. The size of this axe was well thought out. At 15.7 inches you could you use it with one or two hands. Depending on what you are working on and the width of the wood you are chopping, it’s nice to have that option. Another big pro is the included ferro rod and sharpening disc which allow you to be prepared even if your blade goes dull while on a long trip. A ferro rod is a kind of fire starter that is very popular among survivalists. Including the rod and the sharpening disc makes this a great choice for your “bug out bag” because you will feel prepared for any eventuality. At a weight of just under two pounds it is easy enough to pack but would be a bit of a stretch to take backpacking. 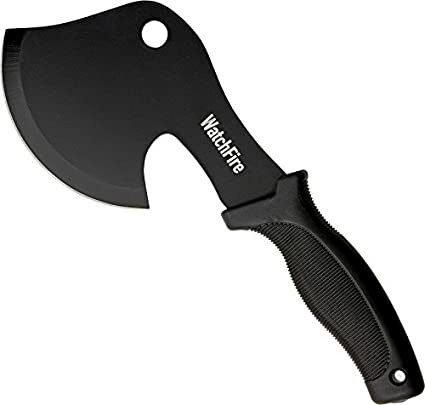 In all, the Schrade survival hatchet is a well constructed and solid little axe and the inclusion of the ferro rod and sharpening disc make it a very solid buy for the low price point. In third place, our bronze pick in this category is the MTech USA Camping Axe. This small and easily portable hatchet is a fantastic choice for your needs while camping or in any outdoor situation. At between $18-20 on Amazon, this well-crafted small tool is an unbelievable value for the money. This is one of the smaller axes in this category, with a length of just eleven inches and a weight of only 14.6 ounces, less than a pound! The comfortable rubber handle is grippy and comfortable enough to withstand lots of repeated use. The blade is made of 440 stainless steel and is three inches. While the smaller weight and size is almost a drawback for serious firewood cutting, for survivalist wood chopping it is still a perfectly acceptable size. Included with this product is a lightweight nylon sheath cover that fits well over the blade and helps it to be transported safely without risk of injury to the owner or the blade. Unlike some other sheaths that don’t fit properly, this one fits on snugly and doesn’t budge once it is in place. MTech USA, officially known as Master Cutlery, is a family owned company founded in 1982. They make their excellent products in the USA. They are a huge manufacturer of wholesale knives, hatchets, and other tactical gear. Their catalog boasts an impressive 4000 plus products, a feature worth mentioning because if you needed to do a lot of outfitting, you might find a way to get a discount when you purchase more products. Even without that, Master Cutlery’s wholesale set up keeps the prices low and the quality intact which has made for many happy customers. The company claims to be the largest wholesale knives manufacturer in the US which gives you an idea of how they keep the quality so high and the price so low. While this axe is unfortunately not full tang, its components are solidly built. It is the smallest of the outdoor tactical hatchets that MTech offers, and they certainly do carry full tang options if that is a feature that is extremely important to you. It will arrive sharpened and ready to use, but the blade is not going to be as sharp as some of the other competitors in this category. One feature this hatchet does provide that most of the others do not is a blunt end that can be used as a hammer. This truly is a useful feature since it can be utilized while pounding in tent stakes or helping to secure a shelter. There are many campsite jobs that require just a little bit of hammering, but carrying a hammer is almost always unnecessary on camping trip and downright ridiculous for backpacking. Because of the small size, this ax could be a great option for older children. Its light weight will be easier for them to wield and the blade being slightly less than razor sharp makes it slightly safer than some of the other options. But with the trade of light weight and small size comes the limitation to the size of wood you can chop. For the remarkable price of just under $20, this camping hatchet from MTech USA will make you keep coming back to their massive product inventory to build on your collection. The discount from their wholesale setup has been passed onto you, the consumer! Our best budget pick in this category is the super low-priced WatchFire Camper’s Hatchet. It’s listed at only $13.93 and includes a stainless steel blade with stylish black finish. It’s a nice looking albeit very small camping hatchet. In this case, you are truly paying for a budget version of something you might normally use at home. It won’t be the same as a typical wood cutting hatchet, this little one is only ten inches and a very light weight. This axe is only eleven ounces when you are swinging it, with the included sheath the entire product is only twelve ounces. It’s not a prohibitive weight to carry so it might be a great choice for camping trips, backpacking excursions or group youth excursions. Some of the cons might include that it is not made in the USA and is not full tang. 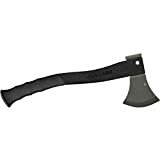 For this price however, finding a full tang hatchet is unlikely and this is a solid little piece that could fit in nicely in a bug out bag or for a lightly used camping axe. Like most of the products in this category, this hatchet is not intended and will not withstand heavy use on large wood. It is intended for those moments where you need to build your campfire, make your impromptu shelter, or clear a path. For these uses, this small tool is an ideal companion. Other outdoor uses for this light-weight axe might be as a go-to tool on a fishing boat. It is light weight and easily cleanable which make it a great option for chopping up chum. No matter what you plan to use it for, don’t expect it to stay sharp continuously. You’ll need to put in some work to keep the blade efficient if you use it regularly. 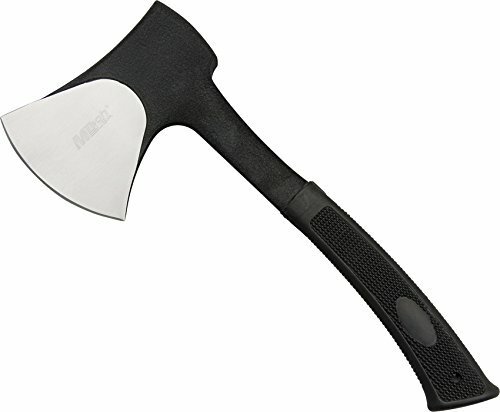 For its incredibly low cost, this hatchet seems like a no brainer for a backup hatchet or one for youth group excursions like Boy Scouts or similar organizations. It’s unlikely to cause as much harm as axes with sharper blades and it is easy for smaller hands to handle. It is an extremely decent value for the cost. Are you building a bug out bag? In case you are not already familiar of the concept of a bug out bag, it is a bag designed to be easily grabbed should you need to get out of your house right away. Hopefully it contains everything that you and yours need to survive for at least 48 hours. What the bug out bag literally does is give you the security to not bug out if you are ever in this most unfortunate of situations. A hatchet is a natural choice to include because it will help you build fire and provide shelter should you find yourself in such a perilous situation. Why include a hatchet while camping? When on an ordinary camping trip, some might question the need for a hatchet. Sure, the firewood at the campsite is pre-cut, but most of the time the pieces are far too large or you’ll need to disperse your wood a little more efficiently between your night and morning fire. In more rustic situations where such luxuries are not afforded to you, you’ll need to use a hatchet to cut and chop your own wood. If you are really heading out into the wilderness perhaps you’ll need to build your own shelter. If you hunt, an impromptu tree stand might be in order. In all these situations a hatchet is simply essential. It is so important to consider the primary user when making a purchase like this, particularly because safety could be involved and the wrong decision might be detrimental. Don’t ever give a young child or an adolescent a tool like an axe without giving them proper instruction prior on how to use it. Always consider that you should have twice the room of the wood you are striking around you clear of other people or your own limbs. For smaller people, a lighter hatchet will be easier to use but it is not as efficient to chop a great deal of wood. Consider this when if you set a goal for your youth to achieve that involves a certain amount of wood to be cut. How Multi-Use Do You Need Your Hatchet To Be? Definitely spend some time considering exactly what you expect to receive when you buy a camping hatchet. Not all of them are tomahawks, or light-weight axes that can be used as a tool or in the worst scenario, a weapon. But those that can function as a tomahawk might be the absolute best choice for a bug out bag or gear box. If you need to make a purchase that will serve you both at home and while you are living outdoors, investing in something that is full tang is highly advisable. Having a full tang axe will insure that stress from usage is evenly distributed throughout your tool. Don’t try to save money with a cheaper investment if you are planning on using any one of these camping hatchets at home. Purchasing a hatchet that is perfect for your outdoor lifestyle will completely change how easy it is to get outdoors. Camping is all about being able to let go and enjoy what is right in front of you. Being able to be fully self-sufficient in the wilderness is a great feeling, and having a quality small hatchet will definitely help your cause if that is your goal.